Leaf spot is the most important fungal disease of cherry. The disease is caused by a fungus known as Coccomyces hiemalis which lives over the winter in the old leaves on the ground. The first infection of new foliage in the early summer is caused by spores which are discharged from these old leaves. After the fungus develops on the new leaves, more spores are produced and they may cause further spread of the disease. Defoliation from leaf spot reduces the number of flower buds and subsequent fruit set for the following year. Defoliated trees are less cold hardy and may be killed by low temperatures in winter. Conventional and organic growers who spray regularly and thoroughly every year seldom suffer any serious loss from leaf spot. However, since the spray materials available for organic growers are not as effective as the synthetic chemicals used by conventional growers, the organic growers have to spray more often. 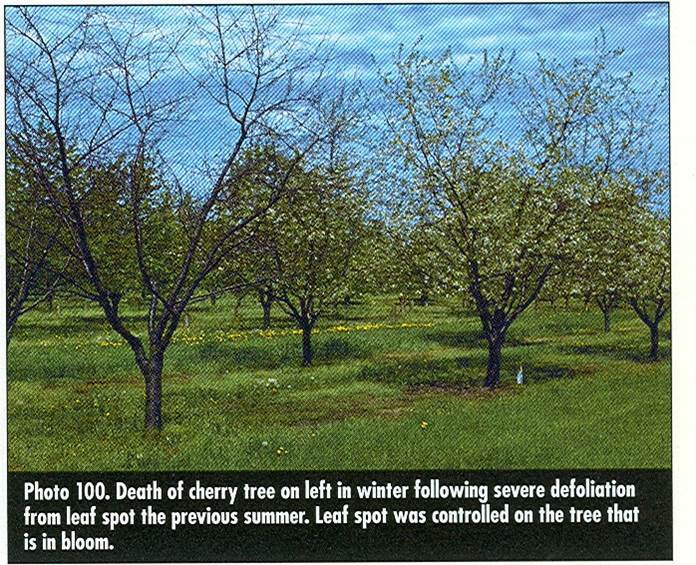 “Cherry leaf spot (CLS)… occurs worldwide and is the most prevalent disease of sour cherry in temperate zones. Epidemics caused by ascospore followed by repeated conidial cycles cause defoliation by midsummer, resulting in low fruit quality. Early defoliation delays acclimation of fruit buds and wood to cold temperatures in the fall, and reduces fruit bud survival during severe winters and fruit set the following spring. Affiliation: University of Debrecen, Hungary. Title: Effect of sanitation treatments on leaf litter density and leaf spot incidence in integrated and organic sour cherry orchards. Source: Plant Disease. 2013. 97:891-896. This entry was posted in Fungicides and tagged cherry, defoliation, disease, fungus, leaf spot, spores, trees by pesticide guy. Bookmark the permalink.